the candidate of the Social Democratic Party, Iyiola Omisore, ahead of the rerun election holding on Thursday. 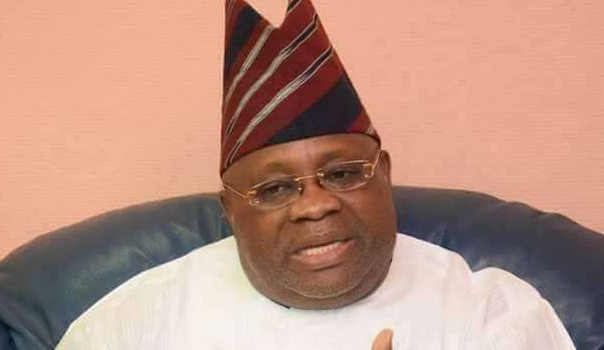 A statement by his director of media and publicity, Olawale Rasheed, noted that the allegation trending on social media that Mr Adeleke’s family had rejected any possibility of working with Mr Omisore was fake and a lie masterminded by the ruling All Progressives Congress (APC). “Senator Ademola Adeleke has openly expressed his willingness for cooperation and partnership with all progressive political forces to consolidate on the victory of last Saturday,” the statement said. According to him, Mr Adeleke has actually spoken with many political leaders and candidates in the last poll. “It was therefore false to allege opposition to the involvement of Senator Iyiola Omisore in the push for victory tomorrow,” the statement said. The statement noted that neither the PDP candidate nor Dupe Adeleke-Sani ever told the senate president, Bukola Saraki, of Mr Adeleke’s opposition to Mr Omisore. “If anything, the family was full of praise for Dr Saraki, Senator Omisore, Prince Olagunsoye Oyinlola, Alhaji Moshood Adeoti and other leaders who have rallied round Senator Adeleke to reclaim the stolen mandate,” the statement further said. The PDP and the APC are wooing Mr Omisore, as three of the seven polling where elections will be held on Thursday are located within his area of influence in Ife.